It’s been another great week for catches of big chub, with five 7lb-plus fish reported to the Angling Times newsdesk. Biggest this week was a whopping 7lb 13oz fish caught from the Great Ouse by Tony Gibson. 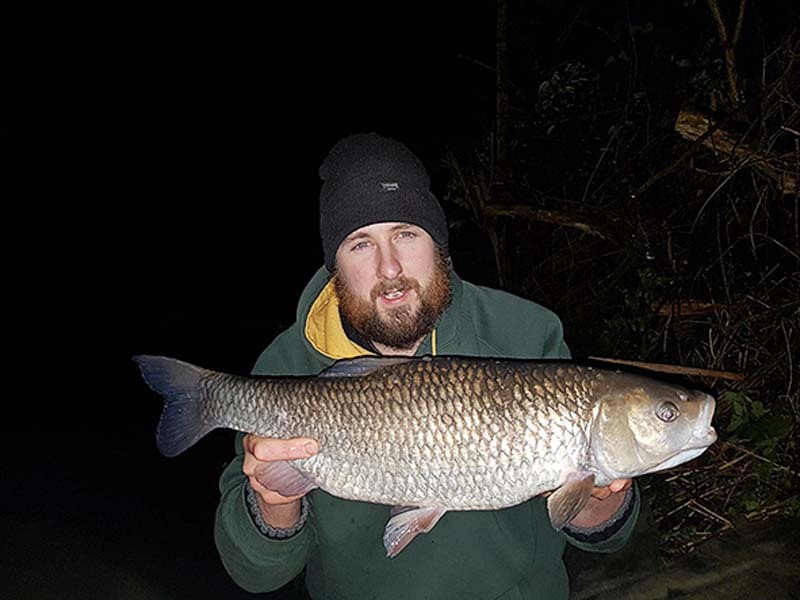 The big Ouse chub tops a remarkable start to 2019 for Tony, who already this year has landed 100lb-plus sturgeon, 3lb-plus perch, 16lb-plus brown trout and a double-figure bream. Talking to Angling Times following the capture of his personal best chub, he said: “I had an unsuccessful afternoon targeting perch on the Ouse, so I decided to switch to chub. Tony’s rig consisted of a paste-wrapped boilie on a size 7 hook tied to an 18ins 20lb coated braid hooklink. Daiwa and Nutrabaits-backed specialist Alfie Naylor once again produced the goods on the River Trent in the form of this 7lb 7oz chub. This fish follows his capture of a 7lb 8oz fish from the same stretch, as reported in last week’s issue. Both fell to Nutrabaits River Range boilies. A free stretch of the Upper Severn in Wales produced this cracking 7lb 9oz chub for 28-year-old Jamie Swinbourne. The big fish was caught on a small piece of crust on a size 8 hook wrapped in cheesepaste. This was presented alongside a cage feeder loaded with liquidised bread. Dave Owen tackled a Cambridgeshire waterway that threatened to live up to its tough reputation – but his only bite of the day on cheesepaste resulted in this 7lb 7oz chub. Dave rigged up a four-SSG link leger on 8lb line and a size 4 wide gape hook. Kings Weir fishery manager Andrew Tredgett was on cloud nine when he landed his third 7lb-plus chub in three weeks, in the form of this 7lb 8oz fish. The famous Lea fishery in Hertfordshire has produced a raft of big chub over the past few months, with Andrew leading the way by consistently catching these large specimens. “First cast was bang on the spot and no more than five minutes later I’d landed a 6lb 14oz fish,” he said.